Musicians include band members from Neko Case, Zubot & Dawson, Be Good Tanyas, Po'Girl, Buttless Chaps, Great Aunt Ida - basically an eclectic combination of key West Coast Vancouver roots and jazz musicians. 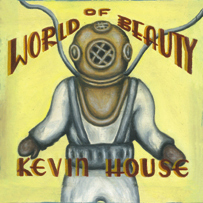 World of Beauty is the second album from reknowned painter/songwriter Kevin House - his canvases and installations have earned accolades from the likes of actor Malcolm McDowell, The Village Voice, and others. His debut album, Gutter Pastoral, through sheer weight of international notice, is possibly the most critically lauded album in Bongo Beat's history. Duality is a word that seemed to come up in reviews of Gutter Pastoral. Musically, lyrically, and visually this also holds true for World of Beauty, with Kevin House moving forward with more fully realized and cohesive arrangements. If there were some forgotten Delta where the chanson and folk blues traditions congregated - Serge Gainsbourg, John Fahey, Nick Drake, Leonard Cohen, Chet Baker - they are all found wandering around in these songs. Like miniature one act plays set to music; little landscape paintings where something is off kilter; melody and dissonance; clouds and stones. The new songs are inhabited once again by disappearing people; carnival folk; strange journeys down twilight rivers - with a seductive backdrop of aged fingerpicked guitars, upright bass, drums, trumpet, and piano. A makeout album for weirdos? Yes, in the best possible way. Miniature chanson symphonies for late night consumption. Headphone lullabys for apparitions and departure heroes. World Of Beauty's musical textures have been created by some of the best Vancouver (Canada) roots and jazz musicians; drummer Skye Brooks (Inhabitants, Tony Wilson), Mike Derrick on guitar and piano, J.P. Carter (Great Aunt Ida, Inhabitants) on trumpet, Russell Sholberg (Tony Wilson) on upright bass, and special guests Jesse Zubot (Zubot and Dawson, Fond Of Tigers) on violin orchestrations, Ida Nilsen (Great Aunt Ida, Buttless Chaps, Mike Scott/Waterboys) piano and voice, Paul Rigby (Neko Case, Garth Hudson) on guitar and pedal steel, and engineered and mixed by John Raham (Be Good Tanyas, Po'Girl). With US and international touring to follow, art exhibits in the UK and USA; World of Beauty will not fail to seduce. "these songs juxtapose the eerie with the ordinary, the stylised and disturbing with the straightforward and normal." "...an album of beautiful disarming sadness.... a revelation." "A moody little haunted house of a singer-songwriter album"
"un petit bijou qui, bien que pas toujours poli, séduit aisément"